This company, in Auckland New Zealand, is just a few minutes from our old home in Auckland. 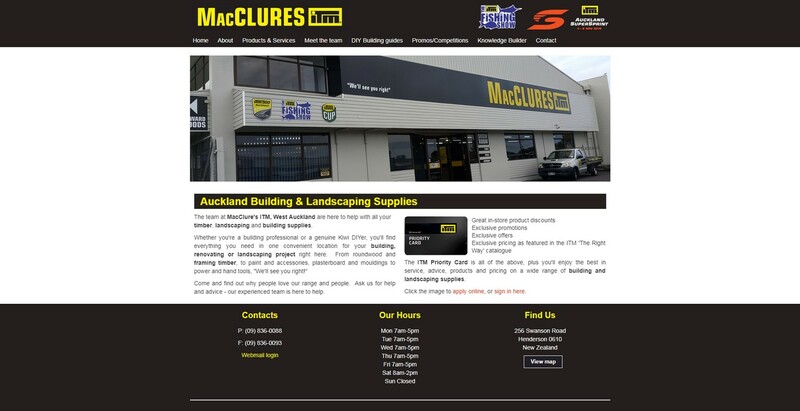 Ian had met the owners of MacClure's during his time as an architectural designer. They never had a website at all, giving their competitors a huge edge online. It took us a while to get the first version of the site live in 2012, but, since then, we've constantly kept the site up-to-date and modernized. This was an interesting project as the company is part of a national chain. So there was a number of emails back and forth with the legal department of ITM NZ to get approval for design, content and, very importantly, colors. We learned a lot about dealing with a chain and feel confident in takign on another corporate/chain project.